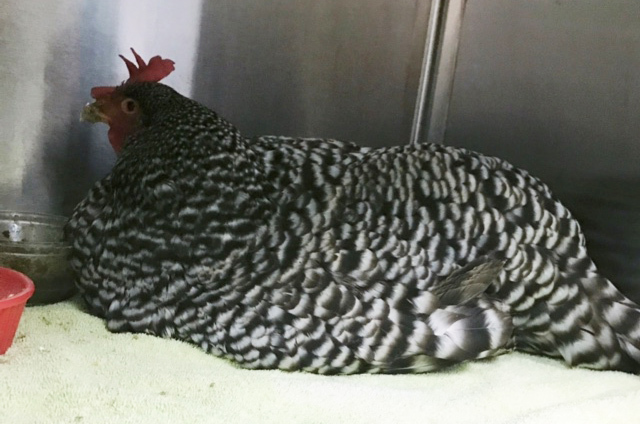 Matilda is an adult barred rock hen who was hit by a car and left to die in the middle of a busy road. A Good Samaritan found her and rushed her to a small animal veterinary hospital nearby----for she was still alive. Upon arrival at the hospital, Matilda was admitted with a rapid respiratory rate, lateral recumbency (lying on her side), gaping and open mouth breathing---she was in shock. The doctor provided her with oxygen, dexamethasone-SP for shock, butorpanol for the pain, and antibiotics (cefazolin) for possible infection. She was also given warm lactated ringers solution under subcutaneously (under the skin). Matilda was alive and stable, however the doctors and staff at the hospital knew that they would need to find her a home. 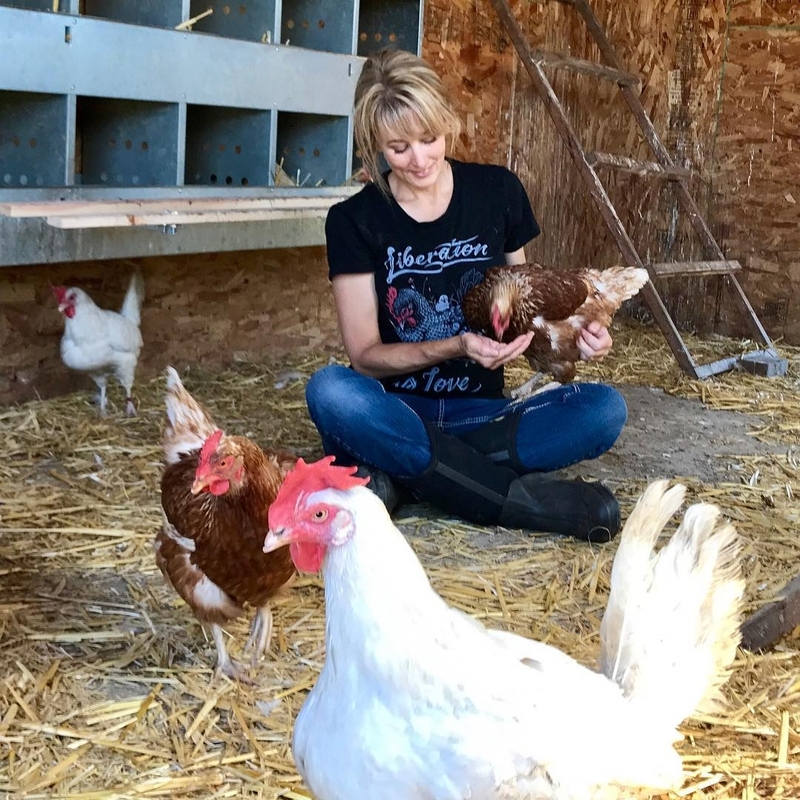 They contacted Shauna Sherick, since they were aware she ran Wildwood Farm Sanctuary and was also a veterinary technician at Newberg Veterinary Hospital. Once Matilda arrived at Wildwood, she seemed fine and was eating and drinking normally, however she was unable to move her legs at all. She also wasn’t laying eggs. Shauna brought Matilda to work with her at the veterinary hospital. Dr. Tina Johnson examined her and took radiographs of her legs and spine. There was no broken bones or spine trauma. 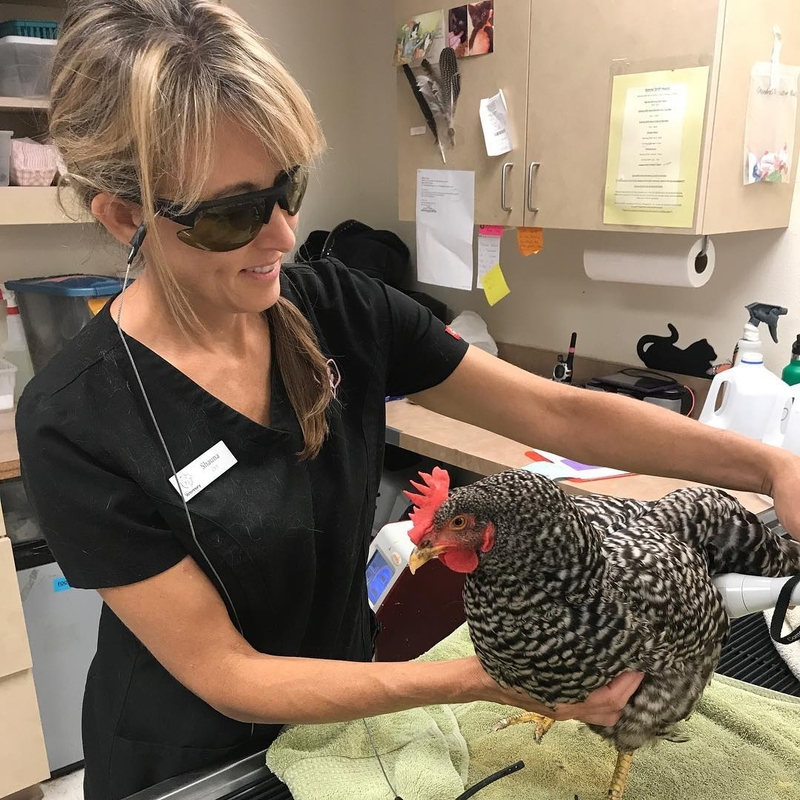 Shauna gave Matilda oral anti-inflammatories (Meloxican), once a day to help with any discomfort, however she felt bad for the hen and wanted to try to do something to help her walk again. 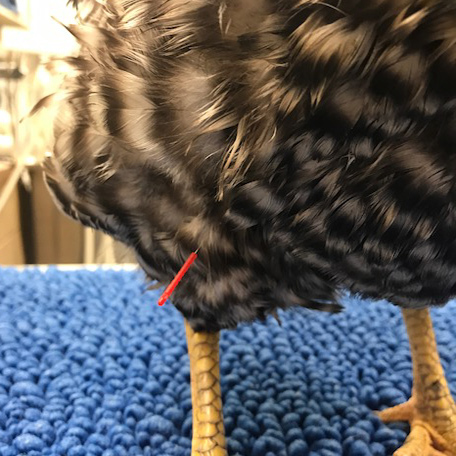 The hospital routinely uses low-level laser therapy and acupuncture on their dog and cat patients for soft tissue trauma and for osteoarthritis pain. Several studies have shown the benefits of acupuncture and laser therapy in patients suffering from paralysis---so Shauna and Dr. Johnson thought, why not try it on Matilda? 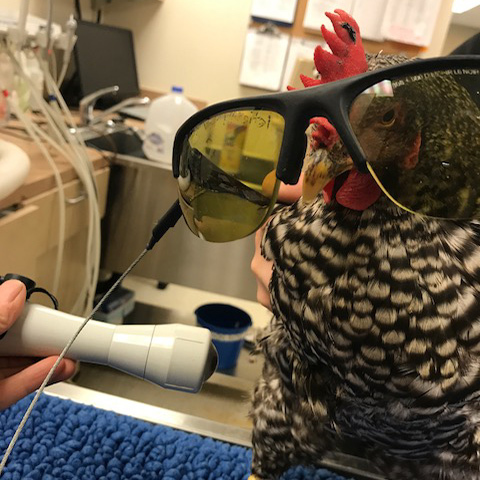 Matilda started receiving laser therapy treatments twice a week, applied over her entire backend and legs for a four week duration. During this time, Matilda also received weekly acupuncture sessions, applied over her leg and pelvis. After a couple weeks of receiving treatment, Matilda slowly began to gain mobility back in her legs. She initially began to get up on her own, then walk, and soon after even run! Shortly after, she started laying eggs again. Matilda standing on her own! Matilda now receives laser therapy treatments once a month, and continues to show improvement in her walking ability. 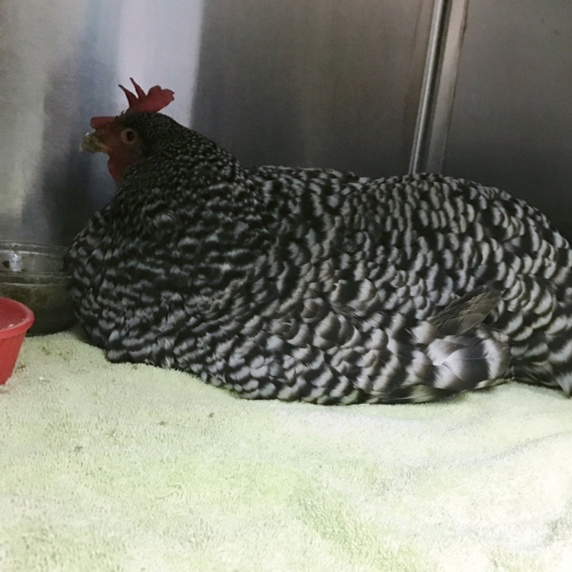 Shauna and her vet were so happy to see that Matilda’s treatment was a success. 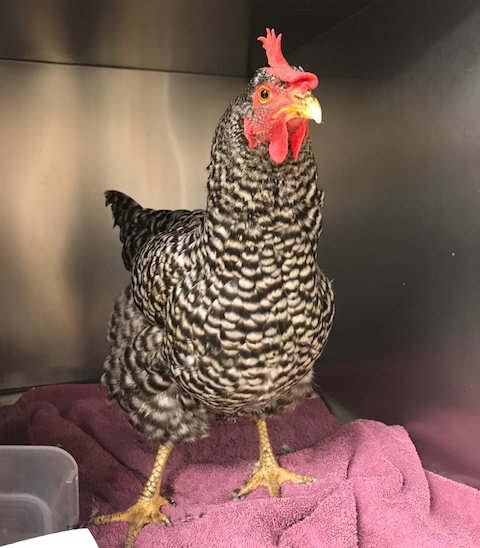 Matilda has since enjoyed her time at her new home at Wildwood---getting to forage in the grass, make new friends with other chickens and farm animals, and most of all her loving human who didn’t give up on her. 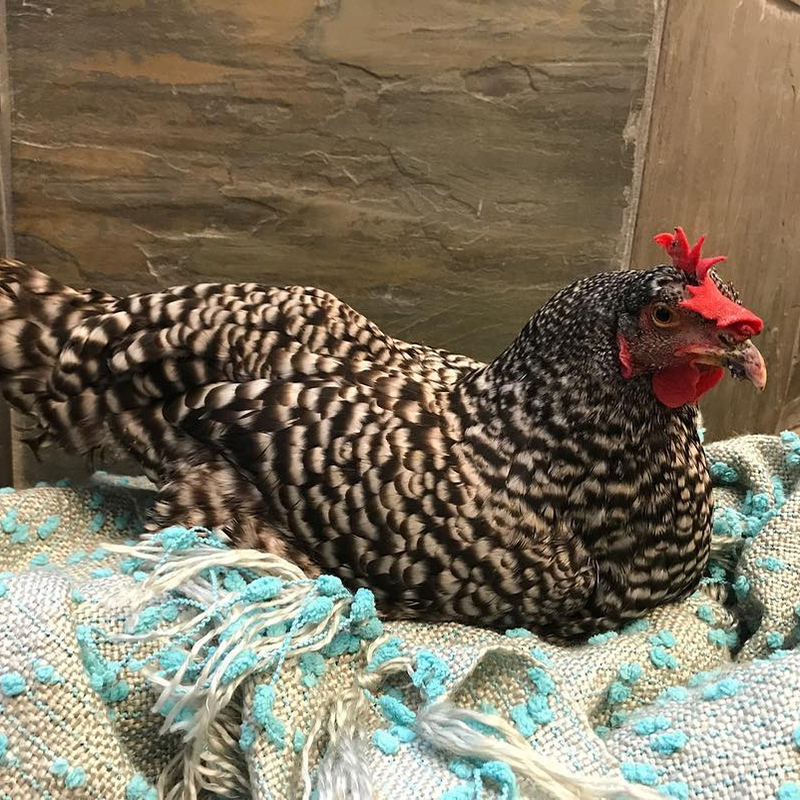 Matilda should be an inspiration to us all----even after getting abandoned by her original owner, hit by a car and left to die, and losing the use of her legs, this determined, big hearted little hen didn’t give up. Her life matters. She is someone, not something. Her life does not have a price tag attached to it---nor does any animal or human for that matter. 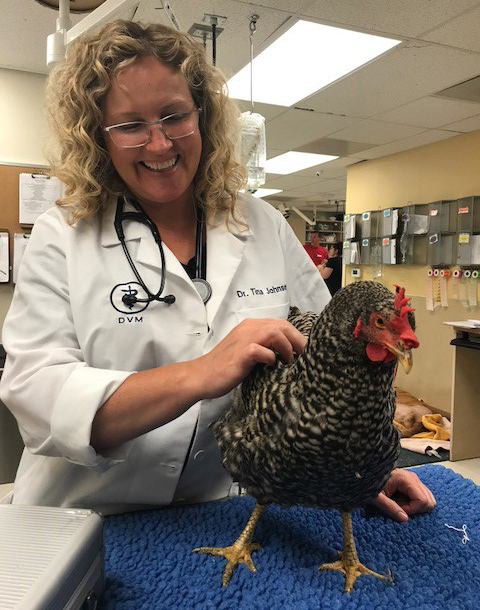 Most treatments that dogs and cats receive work just as well for other animals, like chickens! Wildwood Farm Sanctuary is a 501c3 non-profit organization which is as a haven for rescued farm animals. Wildwood also serves as a protected, cherished place for wildlife and nature. The sanctuary is located on 98 acres in Newberg, Oregon. 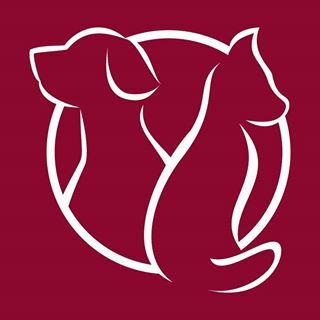 Newberg Veterinary Hospital, located in Newberg, Oregon, is a full-service animal hospital that provides emergency and preventative veterinary services to a wide range of animal species, such as dogs, cats, large animals, birds (including poultry), and exotic pets. The hospital facilities include state-of-the-art surgical suites and 24-hour emergency services. The hospital serves Newberg, Yamhill County, Sherwood, Hillsboro, and more.